KC Electric a full service electrical contractor serving clients throughout Oklahoma. We are a company that was formed with an emphasis on quality, integrity, dependability, and customer service. With over 26 years of combined experience and leadership in the industry, our founders are highly regarded in their communities and in the construction industry. Our extensive experience, highly skilled workforce and keen focus on customers’ needs and expectations make KC Electric a leader in the industry and a contractor you can depend on to live up to our commitments. 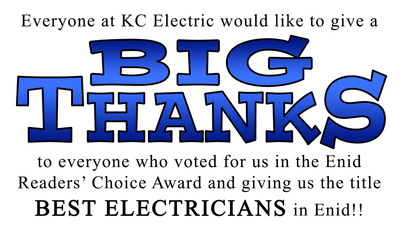 You can feel confident calling KC Electric, knowing that our highly trained electricians will treat you, your family, and your property with the respect and attention to safety you deserve. Whether it's hanging a ceiling fan, installing a custom-designed landscape lighting system, or rewiring a commercial structure, or other electrical services, you can call on KC Electric. We have the power to make things better! Call us today at (580) 242-2299 or fill out our services contact form.